I picked up this book because I really enjoyed ‘Life of Pi’, the author’s previous award winning work and I must say it did not disappoint me. In Beatrice and Virgil, Yann Martel talks about the Holocaust that was executed in Nazi Germany, through an allegory. The story starts with Henry, a famous novelist‘s unsuccessful attempt to publish an unconventional book about the holocaust. The story takes a turn when Henry receives a parcel from one of his readers containing a play and a letter asking for his help. Henry then visits this mystery man who turns out to be a taxidermist by profession and begins helping him out with the play that he is authoring. It is through this play written in the form of conversations between a donkey and a howler monkey (named Beatrice and Virgil respectively) that the author has dealt with his chosen theme – the holocaust. The animals are typecast as victims of an operation similar to the holocaust and through the conversations that they have while in hiding, they try to vent out and get over the tortures inflicted upon them . The plight of the Jews while their extermination was on is very well depicted through the dialogues between Beatrice and Virgil. 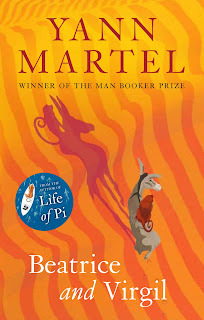 The emotions of shock and fear that Beatrice expresses when he comes to know that his clan is being targeted, the animals’ constant ruminations about how they could possibly move on with life after having gone through such horrors and their efforts to drive out the terrible memories proved to be very heart rending. What I really liked about this book was the way in which such a heavy theme has been dealt with. The atrocities meted out to such a large number of people and the unspeakable agony that they would have gone through has been brought out in a very different manner. Instead of talking about what happened in the physical realm, the author has beautifully highlighted the emotions and thoughts that the victims must have experienced. That, in my opinion, speaks more powerfully than a detailed description of physical torture. I was in deep thought after I finished reading, looked up the internet for details about the holocaust and was deeply pained as I recollected what I had learnt in History class at school. But this time I was able to empathise, though in a very miniscule manner, the pain that the hapless victims of the holocaust must have undergone. A prayer escaped from my being, that such atrocities should never happen in the face of earth again and that the human mind should never stoop to think such thoughts of prejudice so strong, that it can perpetrate such extreme violence and injustice. We all must think twice before we mindlessly nurture meaningless prejudices in our hearts or sow that evil in the minds of children. For, it is this supposedly harmless and small act that grew over the years to cause such an enormous massacre. You can take this up to read if you have an appetite for literary fiction. I got a complete understanding of the author’s ideas and message only on finishing the book. Even after reading about 70% of the book, I was still groping in the dark, wondering where it was all leading to. And then in the last part, there is a sudden torrent of revelations and everything makes sense. In my opinion, this book is not what can be classified as ‘unputdownable’. The author’s wonderful language liberally decorated with novel similes and metaphors, curiosity about what all this could ever lead to and the determination to complete what I’ve taken up led me to finish it.But on the whole, it did prove to be a very satisfying read and I must say that the author has achieved his end which is making the readers revisit and reflect upon the heinousness of the holocaust. to write сοntent to ѕuit yоur nееԁs? I wouldn't mind producing a post or elaborating on some of the subjects you write in relation to here. Again, awesome weblog! and challenging оn ѕitеs I stumbleuрon everуday. Am so glad you like my blog. As for guest posts, I do not plan to do it as of now. Thanks for the offer and for visiting this space!